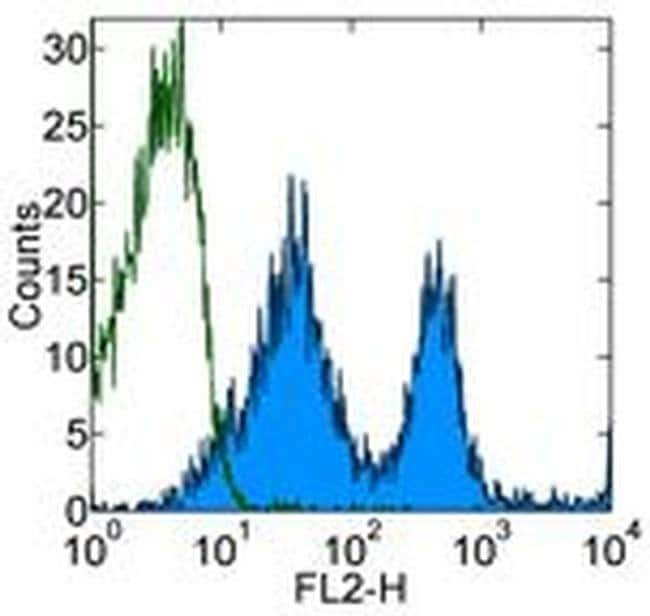 It is recommended that the antibody be carefully titrated for optimal performance in the assay of interest. Excitation: 488-561 nm; Emission: 578 nm; Laser: Blue Laser, Green Laser, Yellow-Green Laser. Filtration: 0.2 μm post-manufacturing filtered. CD43 (leukosialin, sialophorin) is a transmembrane mucin-like protein with high negative charge, expressed on the surface of most hematopoietic cells. CD43 contributes to a repulsive barrier that interferes with cellular adhesion, however, in certain cases also promotes leukocyte aggregation. By interaction with actin-binding proteins ezrin and moesin CD43 plays a regulatory role in remodeling T-cell morphology and regulates cell-cell interactions during lymphocyte traffic. CD43 signaling both enhances LFA-1 adhesiveness and counteracts LFA-1 induction via other receptors. Expression of CD43 causes induction of functionally active tumor suppressor p53 protein, but in case of p53 and ARF deficiency CD43 promotes tumor proliferation and viability. CD43 appears to be an important modulator of leukocyte functions. Diseases associated with CD43 dysfunction include Wiscott-Aldrich Syndrome and Adenoid Basal Cell Carcinoma.